Tyler Perry’s ‘Have and Have Nots‘ is back in production for the 2015 television season. 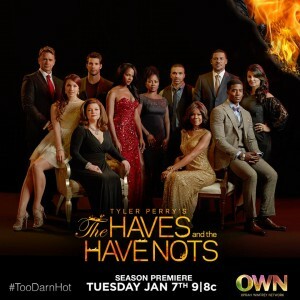 ‘Have and Have Nots Season 3‘ – Episodes of the show are now filming in the Atlanta area and the Tyler Perry show is now casting extras once again. There is a call out for African American men between the ages of 25 and 50 for a scene filming in Atlanta’s Greenbriar are this coming Monday. The extras will be playing Benny’s neighbors. Production on the show is just beginning so if you don’t fit the specs below… don’t fret, the show will be filming for quite sometime so there will be more casting calls. Last season consisted of 36 episodes. The show has been a winner for OWN. The Haves and the Have Nots set a record for all of OWN programming for the season 2 finale this past spring. The show got the highest ratings for the network…. ever, even surpassing Oprah’s interview with Bobbi Kristina. Tyler Perry’s, The Have and Have Nots is based on his stage play of the same name. The show is a prime time soap opera that airs on the Oprah Winfrey Network (OWN). It is about three families living in Savannah, Georgia. Two of the families are the “Haves”, as they are rich and powerful while the other is the “Have Not”. “The Haves” are the Cryer and Harrington families who live an upscale and elite lifestyle. The “Have Nots” are the Young family who are poor and close to the complete opposite of the other 2. Season 3 of Tyler Perry’s ‘The Have and Have Nots‘ will premiere on OWN this coming winter 2015. This show films in Atlanta and is ONLY looking for Atlanta locals who have open availability for this coming Monday. AGES: 20-55 (AFRICAN AMERICAN MALES/FEMALES) WITH CARS…. ANY CAR TYPE IS FINE, YOU MAY HAVE DINGS, BUMPS, DENTS/CRACKS etc… as long as your car is drivable, you can submit it. Please only submit if you fit the above specifications and are local to Atlanta, Georgia. I’m on the verge of making a name for myself in the world of comedy with the blessing call opportunity. I’ve fought cancer twice, and won that battle. (praise God) so victory is mine so said the lord, love to come out to ATLANTA and just show my talent to the world just need the chance i have a story of the life time please hear me, I would love to work with MR. Perry this is (GOD) sent so thanks for this chance. I have a story that need to be heard around the world. I have been waiting on these casting calls forever. It would be my pleasure, and honor to work for Tyler Perry. I have been looking forward to be offered an opportunity to audition for Tyler Perry. Looking to be the next top actress. I’m pursuing my dreams and goals in the Entertainment Industry. I’m definitely looking forward to working with Tyler Perry and Oprah Winfrey as well in the future. My doors are open to any Tyler Perry Plays, Reality Tv Shows, Movies and Also Theater . I am something new, something fresh. I have had a hard life but have not given up on god myself. P.s… all I need is a chance. It’s been a long time dream to work with Tyler Perry or Oprah or any entertainer, actor. I’m still keeping faith. I am interested in some speaking rolls or some back ground work. I am willing to come out to Atlanta if possible.